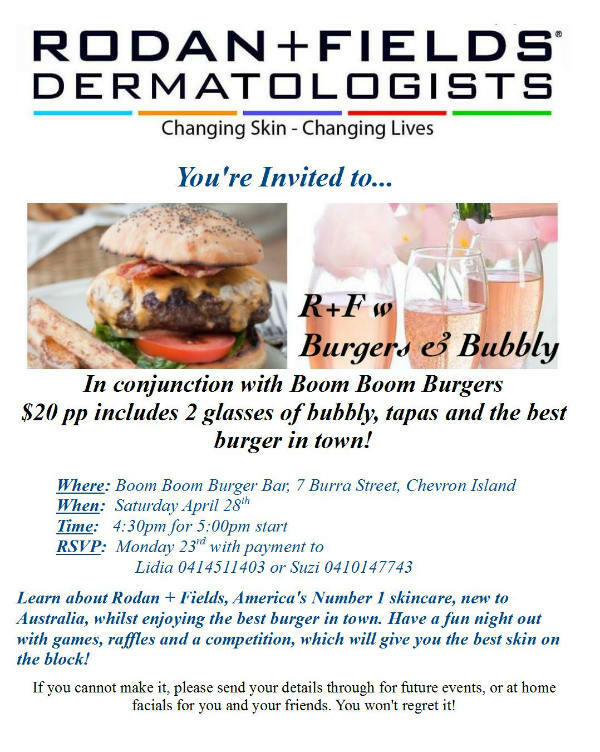 We’re collaborating with Boom Boom Burgers in Chevron Island to introduce Rodan + Fields skincare, which is new to Australia. It is a dermatologically created skin care that is the fraction of the cost of cosmetic surgery, but works. The total cost of the event tickets go to Boom Boom Burgers to cover catering costs. My best friend of 37 years purchased Boom Boom from her hospital bed in Melbourne, so we’d like to bring more Gold Coasters to Boom Boom and offer them an affordable dinner and fun night. We will have raffles and games for those that wish to partake, and also a major competition, also for those that wish to partake with no obligation other than to have a fun, affordable night out. All welcome!